ELKHART LAKE, Wis. - The first SCCA race of the season at Road America proved to be a successful one for the ArmsUp Motorsports group. Revere Greist and Jim Victor each scored a Formula Continental victory during the Susie Bonneau Double Regional. Greist would have the most success of the ArmsUp lineup, earning Buckeyes for two poles and Saturday's win with Victor earning Sunday's win. Jose Paredes, John Dickmann and John Greist also saw action for the first time this season, with each driver putting in solid performances. Revere Greist started off his weekend in fine form, scoring his first SCCA pole position. Fighting a dirty track, his time of 2:18.4 was good enough for the pole by half a second. In Saturday's race, the driver of the number 56 Health Care Technologies car drove to a fine win, eight seconds clear of teammate Jim Victor. Another pole on Sunday and an early race lead looked to give Greist the sweep of the weekend. However, it was not to be as a part failure led to the younger Greist parking his car early. Jim Victor had another solid weekend building on his strong drive at the last Blackhawk National. Just missing Saturday's pole by half a second, Victor drove smart to score a second-place finish in race number one. On Sunday Victor in his number seven Smith Barney car would find more speed improving his qualifying time by over two seconds over the previous day, but still coming in behind Greist on the time sheets. In the race the Iowa driver was able to keep tabs on the leader until inheriting the lead and the victory after Greist's early exit. The win was the first for Victor on the season. Making his long awaited debut, John Greist had a solid opening weekend. Driving Walter Vollrath's car after a testing accident at Road America damaged John's primary car, the Skip Barber veteran drove well to finish both races and gain valuable information. The Madison, Wisconsin driver would score a fifth on Saturday and a second in Sunday's race trailing teammate Jim Victor at the stripe. John Dickmann also made his race debut this year aboard the number 60 EVSCorvette.com machine. After qualifying eighth on Saturday Dickmann improved almost every session he was on the track. A sixth in Saturday's race was backed up with a fifth in Sunday's giving Dickmann his first top-five of the season. 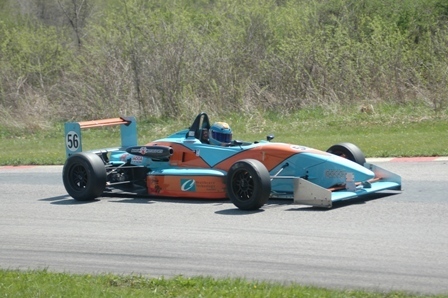 The lone race entrant for ArmsUp Motorsports in Formula Atlantic, Jose Paredes had an up-and-down weekend. Qualifying fourth for race one, Paredes drove steady and clean to finish third in the race. Sunday Paredes would go one better in qualifying putting his Intermed Oncology car third on the grid. Unfortunately, a spin would end his race early. ArmsUp Motorsports will now look to the June Sprints in two-weeks time. As always, the "Sprints" is a big event for the entire ArmsUp team. After tasting victory in Formula Atlantic in 2005, the team looks to repeat that winning performance in both Formula Atlantic and Formula Continental. ArmsUp Motorsports will have seven cars running with Walter Vollrath and Kirk Kindsfater returning to their cars for the 53rd running of the classic Road America summer event. Revere Greist scored his first SCCA race win for ArmsUp Motorsports last weekend at Road America.